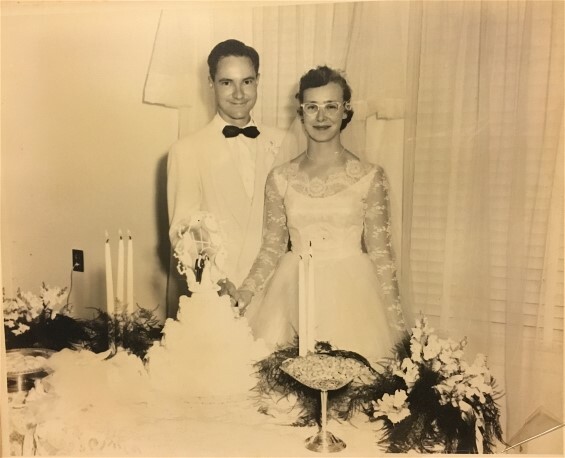 This wedding dress was worn by my grandmother, Jeweldine, in July 1955. She purchased it at a department store in Athens, Georgia, for about $100. She’s kept it in her cedar chest wrapped in a plastic bag ever since. My grandmother’s wedding gown was restored by Heritage Garment Preservation and worn by myself at my wedding on August 25, 2018. 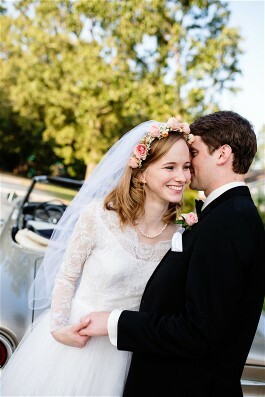 I’ve always wanted a dress with lace sleeves like hers, and I’d looked at a few bridal stores without success. My mother suggested trying on my grandmother’s, and amazingly it fit perfectly! I also work in historic preservation (saving old buildings, not gowns! 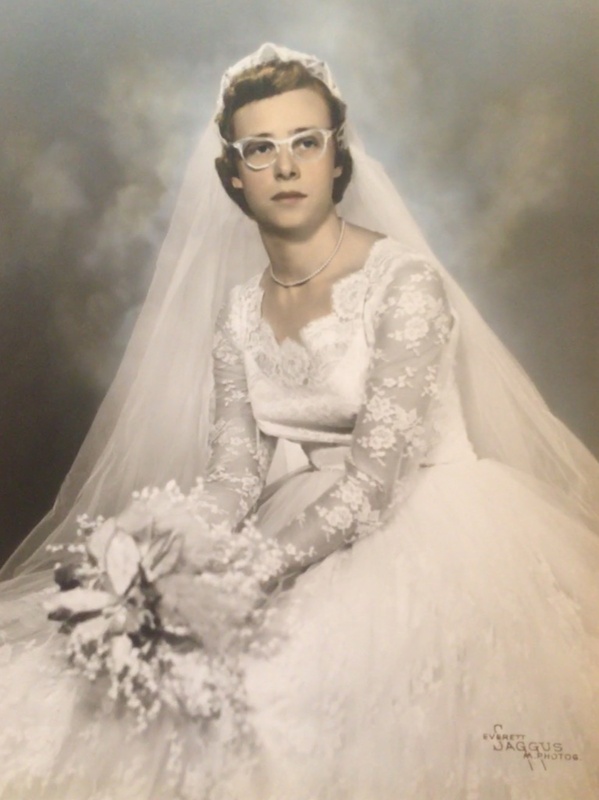 ), and I loved being able to wear a dress with so much family history. 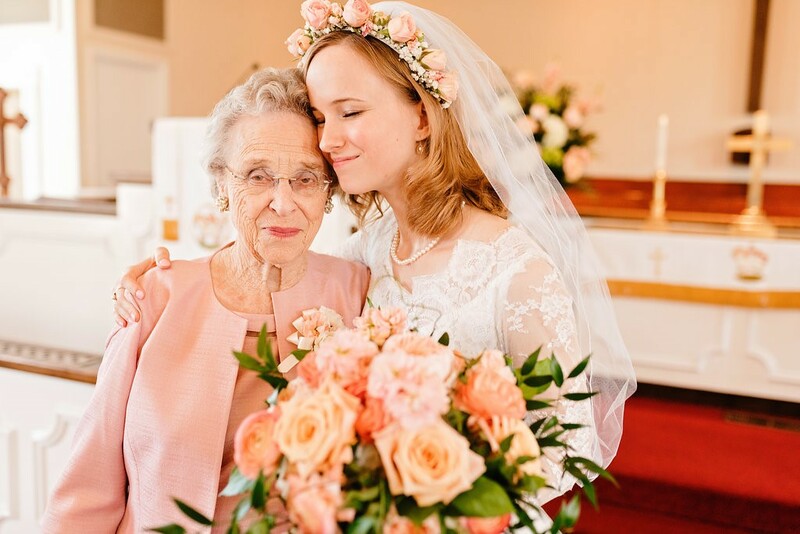 Ellen with her grandmother Jeweldine on her wedding day. Ellen is wearing her grandmother’s wedding gown after wedding dress restoration. 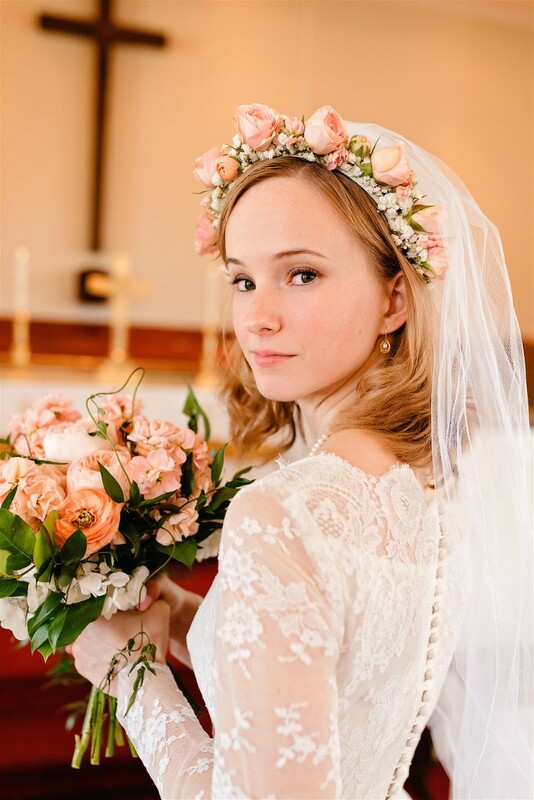 We love to restore family heirloom wedding gowns. Ellen’s ivory satin tea length wedding dress with tulle and lace had severe oxidation spots throughout the lace of the dress. There were a few holes in the tulle layer of the skirt and in the sleeves and underarms. The satin had moderate oxidation stains. We gave her gown a hot chemical treatment to whiten the color and remove oxidized stains. The oxidized color lifted beautifully. We did repair the holes in the lace and replaced the buttons to match the color of the dress. It looked beautiful once finished and ready for Ellen to wear. 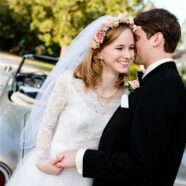 Get a Free Quote for your wedding dress restoration. Absolutely beautiful. So glad my beautiful cousin was able to honor our grandma and our family history in such a wonderful way!